About the only thing keeping Alaska's favorite ex-pat from mixing it up with those elephants on the other side of the fence is a little muscle. With that fitness goal in mind, we bring you Maggie's 10-minute workout video. It's not quite Carmen Electra on a pole. But fans of Maggie will crack a smile, if not break a sweat, watching the latest video from the Performing Animal Welfare Society sanctuary in San Andreas, Calif., where Alaska's lone elephant took up residency at the beginning of the month. The video -- called "Maggie's Walk on the Wild Side" -- was filmed last week on one of Maggie's final days with a couple of Alaska Zoo keepers who spent three weeks at the sanctuary helping her adjust to life in the Lower 48. Angie Bosworth and Jamie Logan accompanied Maggie on a long walk on terrain more rugged than her usual digs, a workout intended to strengthen Maggie's muscles so she's able to physically hold her own once she joins the other elephants. Because the land was outside the view of the elephant cam that is must-see viewing for Alaskans since Maggie's move, PAWS filmed it and put highlights on its Web site. Maggie balks at going downhill! Maggie lies down and gets up without the aid of a tow truck! "We were there for about four hours with her, and she just meandered around," said Bosworth, who returned to her usual job at the Alaska Zoo on Wednesday. "She lay down in the dirt, she dusted herself, she ate some of the trees. 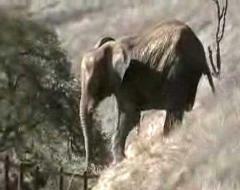 But the 25-year-old remains separated by a fence from PAWS' four other African elephants. Though Maggie's over-the-fence behavior has been encouraging -- she touches, sniffs and trumpets at Ruby, Lulu, Mara and 71 -- she can't join them until caretakers are convinced she's strong enough to hang out with the others. "Our girls have been climbing mountains for years. They're sturdy," PAWS founder Pat Derby said of Maggie's new companions. "There's a lot of pushing and shoving that goes into socialization, and if one of them pushed Maggie right now, I don't think she could plant herself and stand up to it." Hence the walks on the wild side. By taking Maggie into hillier areas, she can build the muscle tone she needs to be a real California girl. Bosworth said Maggie could stand to gain about 100 pounds. "She's definitely not as fat as the others," she said. "Some are definitely rounder than her." Derby said Maggie is adjusting much better than Lulu did three years ago when she moved to the sanctuary from the San Francisco Zoo. The smallest of the Africans, Lulu was terrified of the others and had a difficult transition period. "Lulu had issues," Derby said. "Maggie is no Lulu. She's very sweet." At night, Derby said, Maggie spends a lot of time in the hallway of the barn, where she can be near the others as they settle in for the night. Stalls separate them, but they can still touch. Maggie and Mara have taken to sleeping back-to-back, Bosworth said. So it's only a matter of time, and muscle, before Maggie goes to the other side of the fence. Derby said she hopes Maggie will be buff enough for that to happen in about three weeks.